Summary: Those wacky, lovable Pittsburgh Public Works guys show they can "think outside the pothole." 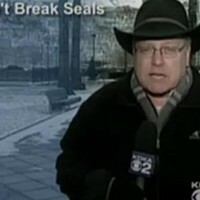 Station: KDKA Reporter: John Shumway, "Live" When it Aired: March 27 Running Time: 2 minutes, 4 seconds Visuals: The tagline "Pothole Plague," as footage reels of assorted vehicles hurdling over what appears to be the surface of the moon. Highlights: * When anchor Ken Rice trumpets, "Fixing the Pothole Plague ... and not just with Band-Aids." * When Rice lays down this folksy foundation: "The weather this time of year almost seems to make potholes blossom. Crews do what they can to patch 'em, but most times there's nothing more than a Band-Aid for this time of year. Now the city's taking an extra step to stop those potholes from popping up." * Shumway's take, "You don't have to look too hard to find them, Ken. And, while you can't exactly see Beijing in this thing, I can guarantee if you hit it, you would feel it." * When Shumway typifies the daily toil of the pothole-repair warriors: "A shovel-full at a time, public-works crews all over the region today were patching the wounds of a Pittsburgh winter." * When he explains what all the fuss is about this year: "This is cold patch, the wintertime pothole Band-Aid until the hot asphalt plants open with the warmth of April. But as it turns out, Pittsburgh crews will switch to hot asphalt tomorrow." * When Public Works Director Guy Costa explains that this is possible because they found a contractor who'd supply the stuff if the minimum order was met. * When Shumway says, "It may not sound like much, but the folks who put their sweat equity into this annual rite will tell you that it is a big deal." * When Shumway tells us that PennDOT probably won't have the mixture for a while, and reminds city dwellers/drivers to call the "Ravenstahl 311 Line" if you find a "particularly troublesome pothole." What We Learned: No wonder the patched potholes didn't stay patched very long -- they were using Band-Aids, for godsakes. Unanswered Question: When will automakers wise up and start making a Lunar Rover hybrid? News Value: 5. Well, if we're going to call it an all-out "plague" here, then this Camus quote seems quite apropos: The gods had condemned Sisyphus to ceaselessly rolling a rock to the top of a mountain, whence the stone would fall back of its own weight. They had thought with some reason that there is no more dreadful punishment than futile and hopeless labor. To wit: Keep on patchin', but don't hold your breath. Summary: Those who signed up for the "Do Not Call" list may once again find themselves being annoyed by pesky telemarketers. Station: KDKA Channel 2 Reporter: Yvonne Zanos When it Aired: March 27 Running Time: 2 minutes, 13 seconds Visuals: Zanos at a station computer, with the attorney general's Web site pulled up. Highlights: * When Zanos reports, "This is something a lot of us forgot: Just because you're on the 'Do Not Call' list doesn't protect you forever. That protection lasts five years; after that, if you don't sign up again, your phone number will go back to the telemarketers who will be able to reconnect with us after all these years." * When she narrates, "Think back. Remember when the phones seemed to ring all day long, one telemarketer after another, interrupting your day? Well, that was before the 'Do Not Call' list went into effect." * When Zanos reminds, "[I]t's been almost five years since the 'Do Not Call List' went into effect back on July 1, 2002. That's back when the Attorney General's Web site was getting 10,000 hits per minute." * When Zanos informs us that we'll be able to sign up again sometime this summer. What We Learned: Ask not for whom the telemarketer calls, he calls for thee. Unanswered Question: You mean people still have landlines? News Value: 7. Consumer editor Zanos has really grown to become an on-air asset to KDKA, right up there with Andy Sheehan and Jon Delano. Her reports are most always informative, they hook a local angle, and she's not over the top or "alarmist" in her delivery. Summary: Sidney Crosby is officially immortal: A doll has been cast in his image! Station: Channel 11 News on Fox 53 Reporter: David Johnson When it Aired: March 27 Running Time: 31 seconds Visuals: * A photo of the dashing and talented young Crosby. * The Sidney Crosby action figurine! Highlights: * When Johnson broadcasts, "Super Hero Sidney! The Penguins' Sidney Crosby getting a special honor. Not one but two limited-edition action figures featuring the young star went on sale, online today." When he adds, "1,500 figures were available ... each priced at $49.95. They sold out in only three hours." * When Johnson finishes, "Upper Deck made the figurines to commemorate Crosby becoming the youngest player in league history to reach 200 career points." What We Learned: How to turn a nice buck with a puck. Unanswered Question: Will we be able to buy "fashion" outfits to go with our Crosby doll later? News Value: 7. Stay tuned, young 'Burghers -- the "Ravenstahl Doll" could be next!